How Much Do New Countertops Cost in 2019? When most homeowners think about countertops, the one that comes to mind is in the kitchen. However, contractors can place countertops in many locations for your convenience, such as the bathroom, laundry room, garage, etc. Wherever you need a flat, even space for doing projects, countertops are an excellent way to answer that need. What’s more, a second or third countertop done at the same time will likely come at a discount. The national average for replacing or adding new countertops is $3,000, and most spend between $2,000 and $4,500. However, the prices vary tremendously between materials. Likewise, the cost of installation will change, depending on your location. Labor rates vary throughout the nation, and the cost of material varies based on distribution and transportation costs to your region. You could spend as little as $500 on a DIY install or up to $7,000 for high-grade material such as granite, marble, or quartz. 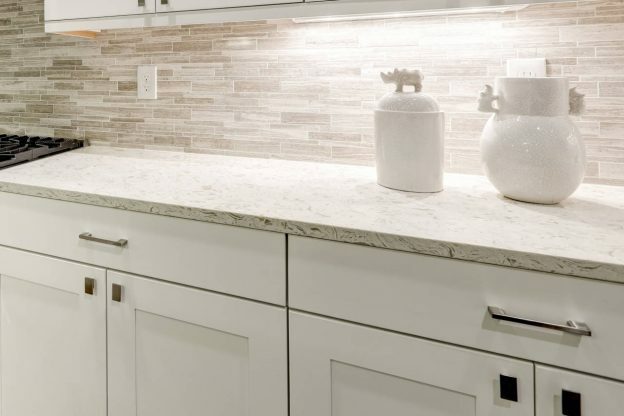 Plus, what’s known as the “waterfall” effect, where the countertop material continues down the side of the cabinet or island will add considerable expense but looks amazing. Installing countertops in small spaces, double sink cuts, edging, polishing, or removing an old countertop will also affect the install price. The size of the countertop will directly impact the price, as it determines the amount of material needed. Try our square footage calculator to determine the square footage for your project. The cost of tearing out old countertops depends on the size and the ease of getting rid of it. Other possible cost factors might be moving plumbing or electrical outlets and if the current cabinets will hold the weight of the new countertops. It will cost between $100 and $300 to take out the old countertop, maybe more if the contractor has to rent a dumpster, and possibly less to DIY. The price of a countertop is largely dependent on the type of material selected. Granite is as durable as it is versatile, with many textures and colors to choose from for the kitchen, bath, and laundry room. You will likely pay a minimum of $20 – $120 per square foot for the slab and another $10 – $100 per square foot for installation. However, prefabricated granite is less expensive. Do not get concerned about natural small cracks in the granite’s surface. Marble is similar to granite in durability, but commonly costs about $50 more per square foot than granite. So, figure $70 – $170 for material and $10 – $100 per square foot for installation. This dark green stone is not as durable as granite or marble. It is a soft stone, so it scratches easily. You seldom get lengths greater than seven feet, so you might have seams. Soapstone is $30 – $150 per square foot installed. Slate comes in a variety of darker colors and costs $30-90 per square foot installed. Concrete is typically 1.5 to 2 inches thick and costs $50 and $100 per square foot. Suppliers can get these stained in just about any color you choose, and they should be sealed regularly to keep them from chipping. Anyone with the time, tools, and know-how can do this as a DIY project. With a little artistic talent, you can even create designs in the concrete or cover it with polyurethane or epoxy. Limestone can be brittle, and therefore needs regular sealing to keep it from getting damaged. It is usually $10 – $30 per square foot before installation. Travertine is a dark, slightly brittle stone with rich veins running through it. The cost is similar to limestone at $10 – $30 per square foot. Other options for countertops are synthetic, solid rock, butcher block, and wood. One of the most affordable choices, laminates are quick and easy to install, though these are not that durable and may require replacement sooner than other products. Porcelain or ceramic countertops are generally inexpensive, between $10 and $60 per square foot installed. However, this is not a countertop to use where there is a lot of traffic or use. It scratches and breaks readily. Engineered quartz is generally $15 – $70 per square foot and cost about the same as granite or marble to install. This manufactured product can withstand heavy traffic and everyday use without sealing. It’s entirely made from resin so it can easily imitate any stone surface. It costs about $25 – $50 per square foot installed. Butcher block and other woods run $15 to $40 per square foot. These are not recommended for the entire countertop because it is prone to water and heat damage but works well for bars or island tops. For those concerned with the ecology, countertops made from recycled materials like paper and glass are a unique option. However, due to the use of resin in the process, it might not be as environmentally-friendly as one might think. Popular paper composites cost about $40 to $50 per square foot. Recycled glass is highly heat resistant and is a very unique finish. It costs $50-120 per square foot before installation. Whichever material you finally decide on and wherever you choose to have your countertops installed, get several free quotes from reputable installers in your area. You might also be interested in our cost guides for refreshing your cabinets, such as painting, refinishing, or refacing, if you need cabinet work done in conjunction with your countertops. Don’t forget, getting multiple countertops done at the same time could result in considerable savings.